A fire broke out at the cathedral of Notre-Dame in Paris on Monday evening and firefighters struggled to tackle the blaze which caused the collapse of the church's roof and spire. The French newspaper Le Figaro reported that flames broke out around 6:30pm, and the mayor of Paris, Anne Hidalgo, confirmed on Twitter that “a terrible fire” struck the medieval landmark. The deputy mayor of Paris, Emmanuel Grégoire, said on French television that “the priority has been given to securing the surrounding area to protect tourists and residents from the risk of collapse”. Located on Île de la Cité in the Seine river, Notre Dame is Europe’s most visited historic monument, with around 13 million visitors per year. The Catholic church still holds daily services, including evening Mass, and was evacuated after the fire alarm went off around 6.30pm. There have been no reports of injured people so far. Videos circulating on social media show the roof engulfed in flames and smoke billowing around the two bell towers. The cause of the blaze at the Gothic cathedral, built between 1163 and 1345, is unclear. A €150m restoration project was currently underway to repair damage the cathedral has suffered from weather and pollution, and the building was covered with scaffolding. The cathedral's spire, which was constructed in 1859-60 during a renovation led by the architect Eugène Viollet-le-Duc and was undergoing a €11m renovation funded by the state, has completely collapsed. Last week, 16 copper statues of the Apostles and Evangelists, added at the time of the spire’s construction, were removed for restoration. The French government signed a bill in May 2017 to spend €60m over the next decade towards the overall restoration project. The planned work includes repairs to one of the cathedral's famous flying buttresses, which was threatening to fall, launched in December and initially due to be completed this summer. The restoration project also comprises work on Notre-Dame’s pinnacles, finials, crockets, railings and stained-glass windows. There were fears that the north bell tower of the cathedral might collapse, but after four hours of fire-fighting, the blaze appeared to be contained late Monday night. 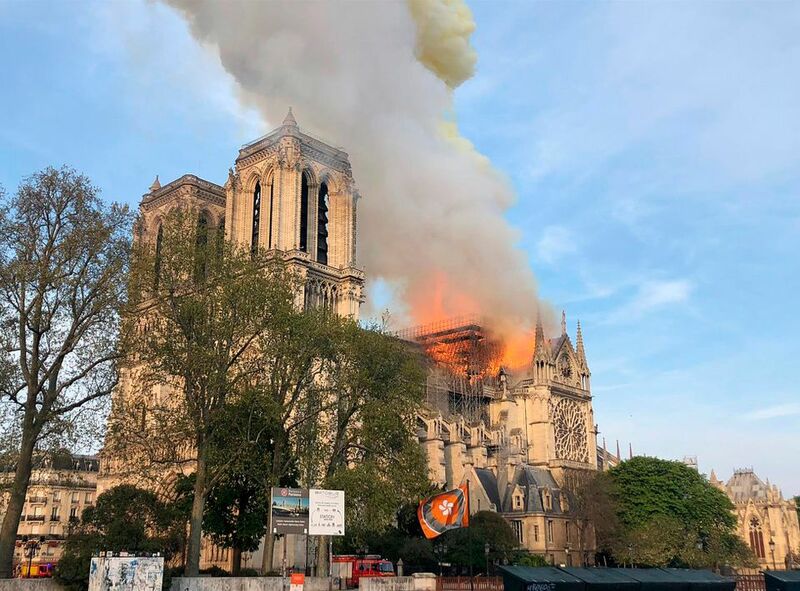 The cathedral's overall structure has been “saved and preserved in its entirety”, according to the commander of Paris's fire brigade, General Jean-Claude Gallet, although two-thirds of the roof has been destroyed. Crowds remained outside the cathedral into the night, some singing hymns and praying. “We will re-build this cathedral,” Macron vowed, and announced that a national public fundraising campaign would be launched.